Wagner wrote Das Rheingold as the grand prelude to Die Walküre, Siegfried and Götterdämmerung, the tripartite Ring, now regarded as 4 operas. This opera is presented in a handsome hardbound volume with colour production photos, essays on the opera and the history of the Ring in Adelaide together with a full libretto. 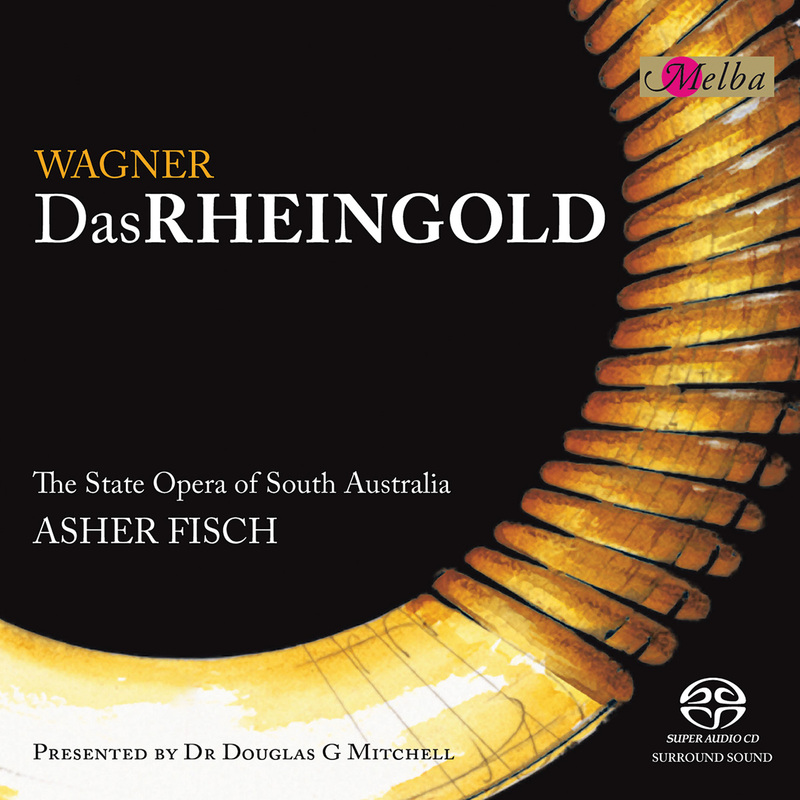 This stunning premiere SACD hybrid surround recording features the talents of the State Opera of South Australia, the Adelaide Symphony Orchestra and a stellar cast conducted by Asher Fisch. Reviews have been staggering for Melba Recordings’ SACD release of State Opera of South Australia’s production of Wagner’s Ring Cycle, recently launched in the UK, USA and Europe. The level of international acclaim for the release of the first instalment, Die Walküre (MR 301091-94) was quite unprecedented! Describing the recording as “as ground-breaking as Georg Solti’s Decca recording … one of the most significant recordings of the decade … energetic …history-in-the-making … a production worthy of Bayreuth … and the most recommendable of recent Walküres”, commentators acknowledge Melba as a spearhead of the international new wave of independent record companies revitalising classical music recording. however selected tracks as part of a 2 SACD set "RING HIGHLIGHTS" are now available. By 1848 Richard Wagner wanted to move away from historically based opera subjects like Rienzi, Tannhäuser and Lohengrin. New translations of the medieval sagas about the dragon-slaying hero Siegfried-the treasure he won from the Nibelung dwarves, his wooing of a fierce Valkyrie bride, and his treacherous murder - were proving attractive to nineteenth century German artists searching their Northern past for a distinctively national mythology. Among the flood of Siegfried plays, essays, poems and even ballets were projects for an opera on the subject by Schumann, Mendelssohn, Heinrich Dorn and Niels Gade-although, before Wagner, only Dorn completed one. The Nibelung Legend -containing in essence the whole story of the Ring - but at first wrote the poem for only one opera, Siegfried’s Tod (‘Siegfried’s Death’), the future Götterdämmerung. Some inner muse told Wagner he was not yet ready to start composing this project and he drafted three alternative opera libretti, including one called Jesus of Nazareth. But by the end of 1851 the Siegfried / Nibelung subject carried the day and Siegfried’s Death was expanded, by three ‘prequels’, into the Ring cycle. Unconsciously Wagner had already been collecting and researching material for ‘my Nibelung dramas’ sometime before they became his next operatic project. In contemporary German translation he had read many of the old Siegfried stories-the Icelandic Eddas and Volsunga Saga, the German Nibelungenlied and the Saga of Thidrek of Bern - as well as scholarly commentaries and play treatments by Fouqué (the Hero of the North trilogy) and Karl Simrock (Book of Heroes). From this secondary reading Wagner, although neither a medievalist nor a scholar, managed to absorb and incorporate into his librettos much of the style and language of the old sagas. A new music drama of the scale he now intended required a new system. So Wagner took himself on a course of self-analysis in the assembling of a libretto for music. Between April 1848 and September 1854 he set aside writing music in order to write essays (their titles borrowed from Liszt and Ludwig Feuerbach, his then favourite philosophical read) about writing operas. Only after this mixture of autobiography, working notes and attacks on other operas and their composers had been digested and published could Wagner begin composing music again. Das Rheingold was his equivalent of the satyr play that used to follow a tragic trilogy in ancient Greece, re-situated by him as a prologue. For the start of the opera, wanting to show nothing less than the beginning of the world (and the beginning of music and language too), Wagner had no clear literary sources to draw on. However, the Siegfried’s Tod libretto had contained a scene with Siegfried and three ‘watermaidens’ and from this Wagner thought his way backwards in the story to create an opening rather like the Bible’s Garden of Eden. A serpent (the Nibelung dwarf Alberich) persuades three Eves (the Rhinedaughters) to give up their knowledge-if not their virginity- so that the apple (the Rhinegold) may be stolen. Two principal themes of the Ring are set out immediately: the conflict between power and love, and the issue of nature being spoiled by mankind. Next up in the story, Wagner paraded his newly characterized (and sometimes caricatured) gods, partly based on scholarly research by the brothers Grimm but shot through with a modern, humanising irony. The first dialogue between Wotan and Fricka (in Scene 2) establishes another important theme of the Ring: the struggle between legality of contracts and artistic, improvisatory decision-making. It is already clear that we are not in the world of historically represented divine beings that one might have expected from a grand opera written in the 1850s. The action of Das Rheingold following Alberich’s theft of the gold was worked up by Wagner from two stories in the Icelandic Eddas. In the first, a giant offers to build the gods a fortress in three seasons, demanding as wages the sun, the moon and the goddess of love, Freyja (Freia). On the advice of Loki (Loge), the gods agree, on condition that the work is completed on time without human aid. With only three days to go, and the task virtually completed, the gods take panic council, blame Loki for making a bad bargain and instruct him on pain of death to find them a way of avoiding payment. Loki does this by disguising himself as a mare to seduce away the stallion which had helped the giant. The fortress remains incomplete, Freyja is saved and Thor (Donner) kills the giant. But Wagner wanted continuity, and something more ambiguous than this happy ending. He turned to a second Edda story about Andvari (Alberich). When three of the gods are held to ransom by a powerful man whose son Loki has killed in error, Odin (Wotan) sends Loki to Svartalfaheim, ‘land of the black elves’, to steal gold from Andvari to pay for their release. Andvari changes himself into a fish but Loki captures him, threatening death if all his gold is not handed over. Andvari gives in but tries to hide a small gold ring. Loki takes this from him by force, in spite of the dwarf’s protests that with it he can increase his gold. Andvari then curses the ring: all who possess it will die. Loki returns with the gold to the imprisoned Odin. His captor insists that the skin of an otter (in fact the body of the son Loki had killed) is stuffed and covered with the ransom gold. This done, one whisker is still showing; to cover it Odin has to surrender Andvari’s ring which he was hoping to pocket. Andvari’s curse is soon fulfilled. The sons of the gods’ captor, called Fafner and Regin (Wagner’s giants Fafner and Fasolt), kill their father for the gold, then quarrel over its division so violently that Regin flees for his life. This Andvari story suggested to Wagner how to keep the action of his Scene 2 going. His twin giant builders of Valhalla demand the gold as a substitute payment for Freia, goddess of love and youth. Then the ‘land of the black elves’ (Wagner made it Nibelheim, ‘home of the mist’) made a perfect setting for the opera’s Scene 3 and in Scene 4 Andvari’s ransom became Alberich’s, and stuffing the otter skin with gold became hiding Freia. By making Freia the object of the giants’ desire Wagner both simplified the action and kept the power versus love theme of the opera to the fore. Wagner now needed a further crisis to continue his drama, linking this ‘prologue to the stage festival play’ with the ‘first day’ (Die Walküre), where human action was to begin with the story of the Volsungs. Wagner turned to his second completed poem Der junge Siegfried (‘Young Siegfried’, the prequel to Siegfried’s Tod) in which he had introduced a Wala, or wise woman, drawn from the Eddas’ Völuspá. Erda, as he called her, warned the gods of their eventual end and made Wotan yield the ring to the giants. Wagner’s ‘new system’ also meant a radical extension of the ways in which music described events, moods and characters onstage. ‘Just imagine’, he told Liszt, ‘the entire instrumental introduction to Das Rheingold is built upon the single triad of E flat major’. The fictional vision of how he wrote this music in his (much) later autobiography spoke of ‘sinking into a strong current of water surging incessantly in broken chords’ and, as the Prelude reaches its height, five different rhythmic movements are in play in the orchestra. Also, throughout the Ring Wagner would clearly delineate physical geography by musical pitch and orchestration. As Alberich climbs up from Nibelheim with lecherous intent in the opening Rhine scene, his music too comes from a dark part of the orchestra, casting a shadow over the previous bright, French Grand Opera-style orchestration and vocal writing of the Rhine girls at play. Later, in Scene 4, the deep brass and percussion in the slow-moving chorale of Erda’s music reveal both a kinship with the Rhinedaughters (the opera’s other creatures of nature) and that Erda herself has come up out of the earth. Once upon a time studies of Wagner’s Ring consisted of lists of leitmotifs, identifying their names and where they came in the score. But Das Rheingold already shows Wagner using these musical themes as far more than mere orchestral subtitles for props and characters. In the transition from Scenes 2 to 3, for example, as Loge leads Wotan down to Nibelheim, four reiterations of the accompaniment to Loge’s phrase ‘women’s beauty and love’, and the restless theme associated with love, remind us of the danger that Freia will be lost to the Gods if they cannot get the gold from Alberich. Drama in the Ring, just as Wagner had planned in his theoretical essays, is created by music just as much as by words. This live recording is dedicated to Dame Elisabeth AC DBE, the Founding Benefactor of the Melba Foundation.